The next couple of days winter settles itself in the north-eastern Alps. A cold front has reached the Alps and brings along vigorous snow showers. Until Sunday massive amounts of fresh snow will accumulate. However, the stormy northwest wind is a disturbing factor and poses some big risk for snow drifts and avalanches. 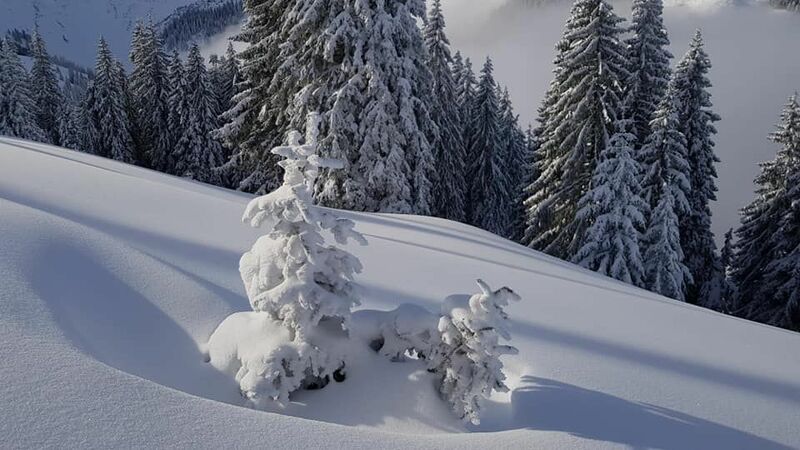 In the coming days, the cold and windy winter weather will be prevail on the northern side of the Alps and the snow cover will grow substantially. The reason for this is a large weather system over the British Isles called Angela. Mild Atlantic air is led to Iceland and arctic cold air directly from the north against the Alps. The damp-cold air masses accumulate on the Alps and enforce heavy snowfall. This weather system and resulting winter weather in the north-eastern Alps will remain for several days. Friday, with the approach of a warm front from the north, snow fall spreads over the rest of Austria and intensifies along the entire northern side of the Alps. The least snow falls in Vorarlberg and on the south side of the Alps in Osttirol and Carinthia. The big hit comes Saturday and Sunday. On Saturday it will continu to snow heavily. At the north side of the Alps a stormy west wind comes up. The snow line therefore temporarily rises towards 700-1000 meters, especially in the west. Also on Sunday, the snow fall in the northern Alps continues, while it is snowing again deep into the valleys. The focus shifts more and more to the West during the day. In the valleys some 45-65cm of fresh snow is expected by Monday. At higher ellevation well over 1 meter of fresh snow is a safe prediction for the ski resorts around and east of Innsbruck. The Dachstein region might even welcome 175cm. The Zillertal, Tenenngau, Pinzgau and Salzkammergurt and the entire Steiermark are doing extraordinary well. But do not forget that the eastern part of Switzerland and the italian Ahrntal also get a nice fresh powder cover of 30 to 45cm. See our powder advice report for the best destinations this weekend. The combination of fresh snow and stormy wind makes the avalanch level situation worse. Don't be surprised to see blocked roads in the weekend in these new snow-covered regions. Also, heavy snow fall on Saturday hinders holidday traffic south of Munchen. 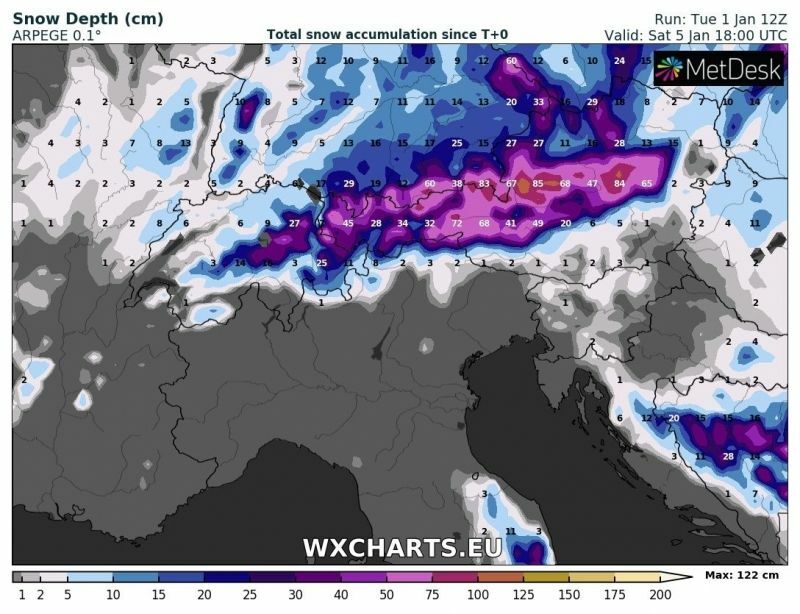 Currently, there's a geographic divide with the East of the Alps and Eastern Europe seeing heavy snowfall, set to continue for at least the coming week, and the West and South not seeing any. 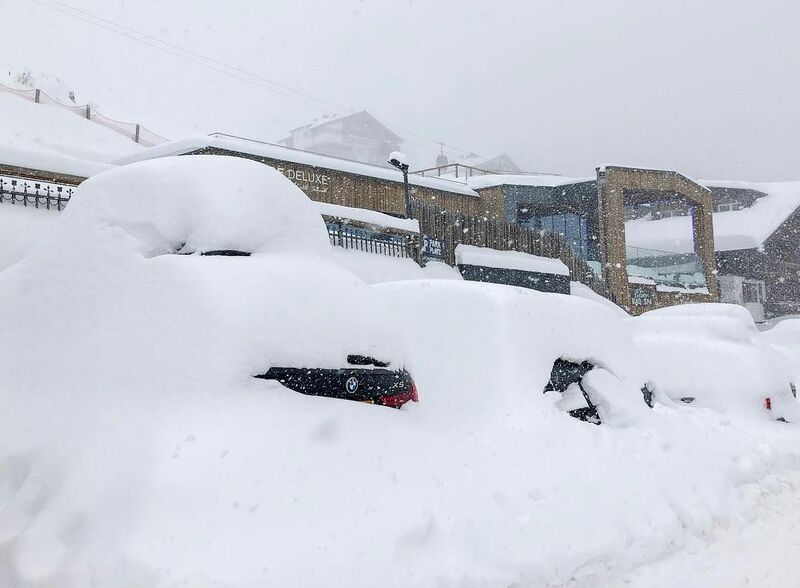 The French and Italian Alps are still left empty-handed as far as fresh snow is concerned. The Nordstau means a lot of sun again for italian and french Alps. The weather models still have not any good news for the period up-to January 11th. Stay up-to-date with our reliable snow forecast and snow depth reports. Did you know that you can download the SkiWeather app by visiting https://skiweather.eu (don't forget the s) on Chrome. The app will be served automatically. See the message at the bottom of the browser.